“You’re doing really good work.” It’s a phrase that those of us who have chosen a life path of service to others hear often. And if that life path includes sacrificing modern comforts and a typical Western lifestyle, while entering into a completely different culture that requires a lot of learning and sacrifices itself just to adapt and absorb into, well then you’re doing really, really good work. And often times when we hear this we try to remain humble and accept the complement while turning it into an opportunity to point out all of the countless others that we would not be able to do such work without. Yet, often in our heads we might be thinking, “Well yeah, duh.” We wouldn’t choose such a lifestyle to do bad work. But underneath this statement there’s always an uncomfortable assumption that the person making the statement doesn’t feel that their own work is “good” or important. Somehow, our work that happens in the nonprofit, aid, or development sectors seems to come with the idea that it is somehow nobler than other professions simply because of the sacrifices and change of lifestyle that comes with it. We get put up on some sort of pedestal where onlookers like to use the apparent goodness of our hearts to somehow also assume infallibility. But the truth is, we’re not saints, and many of us do this work just as much for the adventure and adrenaline rush of the unpredictability of it all or because we simply would go crazy with a normal routine to our lives. The truth is also that many of us use the goodness of our work as a way to determine our own value as human beings in an upside down sort of selfless self actualization. 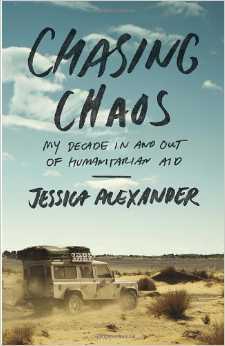 I recently read the book Chasing Chaos by Jessica Alexander, which is a chronicle of her experiences in the international humanitarian world hopping between countries for more than ten years to work with refugees and victims of natural disasters. It’s a book, however, that is much less about the aid work that she did and much more about normalizing the lifestyle of those involved by showing the author’s own personal experience as she tries to navigate relationships, personal discoveries, and professional progress as a typical American throughout her twenties. She just so happens to go through all of that in a number of different countries, with a number of different cultures, and while providing shelter and lifesaving supplies and services to people affected by war, disease, and disaster. Throughout the book Alexander struggles with the perception of her “doing really good work” from everyone while at the same time, she’s just trying to live life. She writes candidly about her condition as an adrenaline junkie chasing after devastation to be involved with through her aid work much more than doing it because she just wants to help people. But she also shares about the conflict she feels when that lifestyle prevents her from ever having normal relationships, or being able to enter into any long-term commitments, or think about a family and a home of her own. While much of the stories that she shares almost seem mundane to someone reading who is in the international development world (which she also points out has its differences from the aid world) it’s kind of refreshing that making them seem mundane almost seems to be the point of the book. By sharing her very regular experiences as a human going through all of these things she takes away much of the wonder and sometimes exaggerated admiration associated with international aid and development work. At one point after spending some time back in New York and hearing so many people’s reactions to what she did she writes, “People like me, out there “doing God’s work” and “saving the world,” wanted to get drunk and laid, too. We have the same concerns – ageing, putting on weight – as anyone else. It just so happened that the dull, daily work of caring – the familiar task of living our lives – was played out against a backdrop of humanitarian catastrophe.” She doesn’t write her stories to make herself out to be a hero or to even to promote the extraordinary efforts of the agencies that she worked for, but to humanize those doing the work. And although from a literary standpoint, that might not make the most exciting book ever to read, from a humanitarian standpoint, I do think that it is a very important concept to share with the world. The very fact that we do spend so much of our time committed to this vague notion of doing good makes us grasp all the much more for ways to simply live our lives outside of that notion as well and sometimes even leads us to succumb to those vices even more that counteract all of the good doing. The deification of doing good can often times lead to greater problems for those of us doing the work and it would be much more helpful sometimes if people realized just how real, and banal, and sometimes difficult our everyday lives can be when we’re just trying to take care of ourselves and our own needs whether they be physical, mental, emotional, relational, or whatever. Being so smitten by how we do such good work can just end up putting extra stress and unnecessary expectations on us while feeding that doubt and inadequacy that we already have to deal with as human beings. And those things all make the doing good much more difficult. If more people understood the nitty gritty, sometimes ugly side of doing good, it may even lead in the long run to smarter donations, more effective interactions, and better support for those that need it to continue making the work possible. It’s unreasonable to expect that every person that uses somebody’s donation to do something good would be the next Mother Theresa. And for that matter, even Mother Theresa didn’t spend every moment of her life helping lepers and feeding the poor. And she was a saint! Even Jesus Christ spent more time making furniture and hanging out with his friends (probably telling jokes about the Pharisees and drinking wine) than raising people from the dead. And he was God! So how much more reasonable to expect is it that we mere humans who have simply chosen this line of work as humanitarians would also need to spend time just living life. Once you make that commitment and jump into this world of aid or development, sometimes it feels like that becomes your biggest fight, just trying to gain the freedom to live your life without worrying about how it might be viewed as affecting your “good” work. So, you want to learn more about Sudan or Sri Lanka, or Sierra Leonne, or Haiti, don’t read Jessica Alexander’s Chasing Chaos. But if you want to see how one woman struggles to live life while helping others improve their lives in all of those places, then definitely read it. And if you want to keep seeing how one guy like me tries to balance life and doing good here in Haiti, keep reading the Green Mango Blog. I may not share quite the normal life stories that Alexander does, but I will keep sharing stories of life as I search for meaning within the mundane and better ways to understand the doing of good. If you’ve read the book, I’d love to hear what you thought of it in the comments. Yes yes and more YES! In the end, We are still human beings with the same needs, wants as anyone else and often it’s compounded by the work we choose to do. Thank you for this post, I needed it today and look forward to reading Chasing Chaos. Thanks, Lee. I finished the book about a week ago and still am not sure how I feel about it. I agree with you that our work is full of the everyday banal activities of surviving and helping – washing clothes, getting the car fixed, figuring out why so few people showed up for a meeting, eating beans and tortillas – as well as the continuing struggles of sustaining hope, of dealing with relationships and loneliness, etc. But I found myself a little “saddened” by Jessica Alexander’s book. Adrenaline isn’t enough and trying to get what is needed to care for refugees or those affected by natural disasters isn’t necessarily what this work/ministry is. I guess I was saddened because her work seemed like flittering from one part of the world to another, seeking a disaster to respond to. There is an investment in making sure that people get what they need physically – but are lasting relationships of solidarity made between the givers and the receivers (because that’s what humanitarian emergency aid usually is). Settling in with a community, as you do, is really important, partly because it means that you are getting involved int he lives of real people whose names you know. Another thing that saddens me – and that she occasionally mentions – is the competition between aid organizations. I see this – and it seems such a waste of time and money and a way to further dependency on outside agencies. This is a real problem here in Honduras – where the people’s initiative has been undermined by aid agencies as well as by the government. I’m still trying to figure out what I really think about the book, but these are a few of my first thoughts and feelings. Thanks for your feedback, John. I agree as well that there were parts of the book that revealed some disappointing things. I can’t say I loved the book, and if this was a real book review, I wouldn’t give it 5 stars, but I did find value in some of the things she shared about her everyday life in these situations as shared above. Also, I think that it’s important to draw the difference between relief aid work and long term development such as what you and I are doing. She mentions this difference casually a couple places, but doesn’t go into it in detail. Which is why, my recommendation of the book depends completely on the reader’s intentions in wanting to read it. It certainly wasn’t what I was expecting when I decided to read it. But I do think that it brings up some points that deserve a healthy dialog in our sector of work and also deserve some illumination to those outside of our sectors. Also, Alexander is a friend of a friend and although I couldn’t necessarily see myself writing some of the things she wrote, I could certainly identify with many of the feelings of pressure and personal conflict that she shared through her stories. Plus, most of this post was a draft that I had written already before I even read her book, her perspective just fit into it nicely.